Some Original Nine 1st Generation Beanie Babies can be worth money. It all depends on certain factors, mainly the tags. Versions that have 1st Generation Tush Tags are the ones to look for. Most of the Original Nine Beanie Babies were continuously released in other Generations. You might have a Legs The Frog Beanie but if it doesn’t have the 1st Generation Heart Tag/1st Generation Tush Tag it’s not worth very much money. 1st Generation Beanie Babies that sell for the most money are typically authenticated by 3rd party services such as: PBBags, True Blue Beans and Peggy Gallagher. 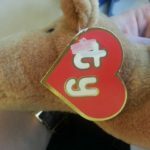 Many fakes and counterfeit Beanie Babies were created during their popularity in the 1990’s which created a need for these authentication providers. 1st Gen Beanies without the “Hang/Heart” tag are worth considerably less than ones that do have the tag. Typically, the “Tush Tag” is always attached to the Beanie as it would be difficult to remove unless cut off. 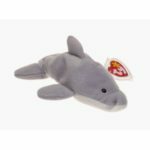 Beanie Babies that are 1st/1st Generation are easy to tell if they have the two tags. The Heart Tag will not open like a book. 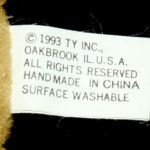 The Tush tag is the most simple of all Beanie Baby generations and you can see information about 1st Gen Tush Tags here. See what some of the top 1st Generation Beanie Babies have sold for on our value tracker page. Watch this video to see what version your Original 9 is! Originally released under the name Brownie. Besides the tags, Cubbie and Brownie are designed the same. Ones with the Brownie tag are almost impossible to find and are extremely rare. But 1st Generation tags with either Brownie or Cubbie are also very difficult to find and are worth money. In 1993, Brownie and Punchers (Pinchers) were the very first Ty beanie babies to be shown to the public. The Original 9 Beanie Babies were then displayed at the New York Toy Show in 1993. There are five generations of the Ty hanger tag and six generations of the tush tag. The only ones worth money are the 1st generation and the 2nd generation hanger tag versions. The Chicago Cubs also gave away many of these bears at games, the first giveaway being in May 1997 (10,000). Cubs giveaway versions can be worth about $10-50 depending on the condition. The Chicago Cubs versions come with a special card that state which giveaway date the bear comes from. One of the first two Ty Beanie Babies ever released along with Brownie (Cubbie) under the name Punchers. It is believed that the Punchers name was just a typo mistake and was quickly changed to Pinchers on 1st Generation tags. Versions with the mis-spelled 1st generation tag are worth good money but are very rare and virtually impossible to find. 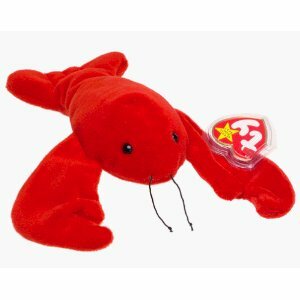 1st Generation Pincher Beanie Babies are the ones worth the most. In nice condition 1G Pinchers can be worth more then $100. There appears to be versions with “long antennas”. There are five generations of hanger tags for Chocolate the Moose. Ones with the 1G tag can sell for a lot, easy $200 and the better the condition the price goes up from there. But 2G and 3G versions can sell for a little bit as well. Like most beanie babies, the lower the generation tag (1G, 2G, 3G) the higher value the beanie baby may be worth. 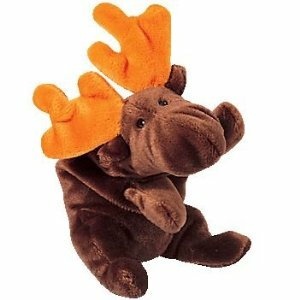 One unique characteristic about the 4G version of Chocolate the Moose was that it was the first Ty Beanie Babies to feature a poem. You can guess what Chocolate the Moose’s favorite treat must be! Very popular Halloween beanie baby. 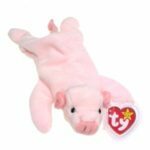 Squealer the Pig was one of the longest running beanie babies from the Original Nine, not retiring until 1998. But the values for Squealer The Pig are a little lower then some of the other beanie babies on this page. Some 1st Generation versions can sell for under $50. 3G – 5G hanger tags are not worth very much money, typically less then $5. Squealer would be a great start to your 1st generation collection because you can find them relatively cheap on places like eBay and Amazon. Splash and Flash look a lot alike, Splash is the black and white whale version and Flash is grey. Splash was one of the very first beanie babies to be retired and only has four generations of hanger tags. 1G versions can be worth upwards of $200+ and ones in good condition sell for even more. First Generation Beanie Babies might also have the Ty (UK) LTD sticker on the back making them even more rare. Having the UK sticker on the back of the Ty hanger tag will increase the value on all 1G Beanie Babies. Flash and Splash made their debut at the same time and were also retired at the same time. 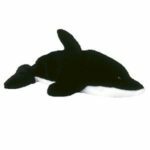 Ty began making Echo the Dolphin after they retired the original two whales. There is a very rare 4th Generation Hang Tag variation on some of the Flash Beanie Babies that spell the name “Fiash”. Prices for Splash and Flash are about the same. 1G versions are worth something and the generations after are not worth nearly as much. Common 3G and 4G Splash Beanie Babies are only worth in the $3-9 range and can be found very easily. 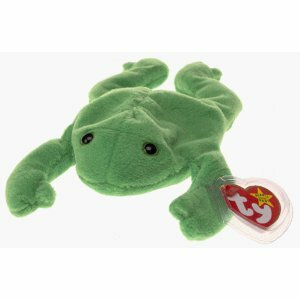 Legs the Frog is one of the most mass produced beanie babies but 1st generation versions can still sell for about $100 in decent condition. After the 1G versions there are not any Legs The Frog’s that are worth very much money. All of the original nine beanie babies were mass produced after the 2G versions. None of the 3G, 4G, or 5G beanie babies carry much value from the original nine series. The very first Spot the Dog Beanie Babies were produced with no spot and come with the 1G hanger tag. Those are very rare and worth more then most 1G original nine babies. 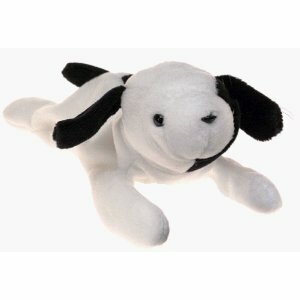 The 2G Spot the Dog Beanie Babies come with a spot. 1G and 2G versions are some of the most valuable out there, and even the 3G Spot the Dog can sell for $25+. All other 1G Original Nine Beanie Babies were released in 1993 but Spot the Dog was born on Halloween 1995. It is believed that less were produced and therefore 1G and 2G versions can have value. 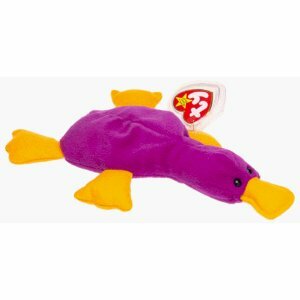 Patti the Platypus went through many different color schemes. 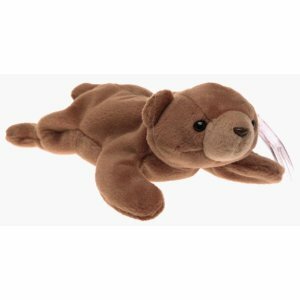 It is one of the most commonly found Beanie Babie. 99.9% of all Patti’s are worthless. The only versions that have any value will have a 1st Generation Tush Tag. Patti is named after one of Ty Warner’s longtime girlfriend and business partners Patricia Roche.